Low cost alternative to FiberThin & ZetaCap? Metamucil weight loss? You've got to be kidding! Yes, that was my initial reaction too on hearing this humble laxative being touted as a serious diet aid. I was even more sceptical when I saw it being compared to much-hyped diet supplements like FiberThin and ZetaCap. But as ObesityCures.com, is committed to reporting on all possible obesity solutions I decided to research whether Metamucil Weight Loss was for real or just another diet scam. 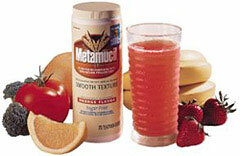 Metamucil is not a miracle weight loss product. If you're looking for the elusive magic potion that will allow you to eat whatever you want, never exercise and still shed the pounds, you may as well stop reading now. In fact, you may as well stop browsing the web, because it doesn't exist. Of course, you'd never think so reading the advertising hype for weight loss products like FiberThin and ZetaCap. Anyone gullible enough to swallow their claims would swear they'd uncovered the holy grail of diet aids. Some promoters of ZetaCap even call it an alternative to gastric bypass surgery! Yes, good old fashioned fibre, just like that found in Metamucil - but at a fraction of the price. You've probably read that eating enough fiber is crucial for good health. Fiber can lower blood sugar levels, keep your digestive system healthy, improve regularity and prostate health and even lower cholesterol levels. So how does fiber contribute to weight loss? It doesn't take much imagination to see why a digestive system that is healthy and regular will be more efficient at purging itself of excess food before it can be absorbed. But it appears that fiber promotes weight loss in another way. According to the peddlers of expensive fiber-based diet products, they "increase satiety". Which is a fancy way of saying that they make you feel fuller quicker. The problem is, they make your wallet emptier quicker too. The best way to boost your fiber intake is to to eat more foods that contain it naturally. Foods like wheat bran, oats, rasberries and celery are not only high in fiber, they also contain vitamins, minirals and anti-oxidants. Unfortunately, research has shown that the average North American's diet is woefully deficient in fiber. This is where a dietary fiber supplement like Metamucil - or its over-priced, over-hyped counterparts - come in. In his excellent ebook, The Ultimate Fat Burning Diet Primer, Paul Crane, makes a convincing case for Metamucil weight loss. He recommends beginning meals with a serving or two of orange-flavored Metamucil, "because it will fill you up without adding calories, making it easier to eat less". And in an article highly critical of expensive fiber-based diet products like FiberThin and ZetaCap, Crane writes, "I'd recommend you save your money, eat high fiber foods, and supplement with a serving or two of Metamucil before meals if you find yourself overeating!" After researching the subject in some depth I'd endorse that advice whole-heartedly. Metamucil is no miracle diet aid. It's sold as a dietary supplement and laxative, not a weight loss product. It's pretty unglamorous and it doesn't have thousands of online affiliates trumpeting its unrealistic weight loss claims. But, if you're looking for a down-to-earth, reasonably-priced, safe product to supplement your existing weight-loss efforts, including healthy eating and exercise, you could do a lot worse than Metamucil.